I was over at my parents’ house and we decided to experiment on grilled shrimp. We were looking for both hot and sweet, so we decided to go with honey and hot sauce. But what sort of heat? For this trial we divided the shrimp in half and used Sriracha in one batch and for the other we used good old Louisiana hot sauce. The Sriracha had a rounder, more full flavor, although the Louisiana hot sauce was still pretty tasty. Try it with your favorite hot sauce! Use scissors to cut the back of the shrimp shells and remove the vein. Place the rinsed and drained shrimp in a quart bag. Microwave honey for about 15 seconds until it has loosened a bit. Mix with a hot sauce of your choice. Pour over the shrimp and massage to coat. Let marinade for at least 30 minutes in the refrigerator. Set up the grill for direct cooking. Place the shrimp on the grill and baste with melted butter and lime juice. Grill one side and flip over after 2-3 minutes and the shrimp are starting to go pink. Baste again and cook until done through. You can serve this with rice or make tacos with it or, be like us, and just sit and peel and eat until you’re ready to bust. Mmmmhmmm, good! I was browsing around the interwebs the other day and came across a recipe for Chocolate Chip Cookie Brittle. 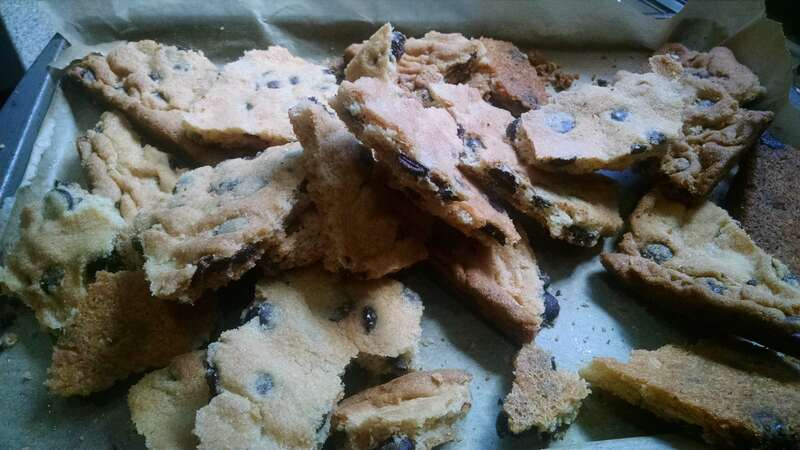 Brilliant – brittle plus chocolate chip cookie! Quite yummy! I switched out bittersweet chocolate morsels for semi-sweet to cut the sweetness a little and intensify the chocolate. I also put in more morsels because it didn’t look chocolately enough with just the one package. Preheat the oven to 375 and line a 10×15 inch baking sheet with parchment paper. Cream the butter, vanilla, salt and granulated sugar together until it is well-mixed and fluffy. Add the flour and beat until well-incorporated. Toss in the chocolate chips and mix completely. Press the cookie dough into an even layer in the prepared baking sheet. Bake the cookie brittle for 25 minutes, or until it turns a nice golden brown color across the top (the edges may be a bit darker). Allow the brittle to cool completely before breaking it into large chunks. Early this morning, more than 100 people were killed or injured at an Orlando, Florida gay hotspot simply for who they loved. The mass shooting at the Pulse nightclub is another in a long string of attacks against the LGBTQ community – in fact, there have been more than 10 transgender people murdered in the United States in the first five months of 2016 alone. I cannot fathom such hate any more than I understand the fear mongering and ugly lies spread by those who seek special legal protection for discrimination based on religious belief. Not understanding, I have turned to baking and hope that bittersweet chocolate can give me some solace, even if it can’t fill the hole in my heart. 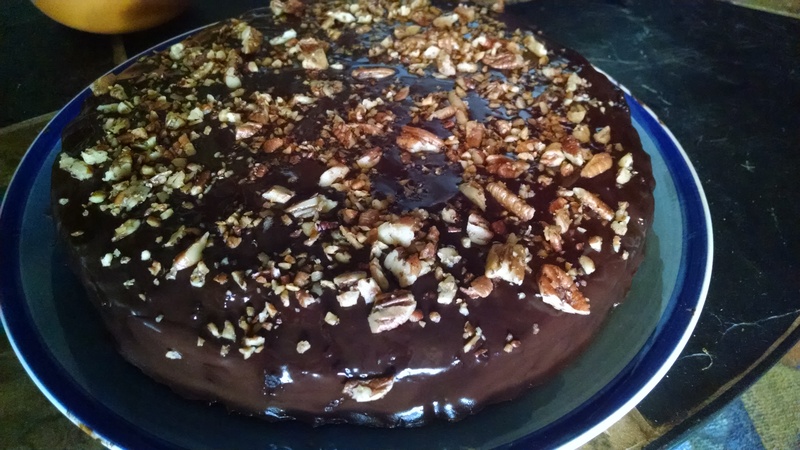 This started as a recipe from the Ghirardelli Chocolate Company that I’ve added Creme de Cacao and pecans. In a double boiler, melt chocolate and butter until smooth. Remove from heat. Combine flour, baking powder and salt and mix to combine. In another bowl, mix together sugar and eggs, combine thoroughly and slowly add the cooled chocolate mixture. Stir to combine. Add Creme de Cacao or vanilla extract and mix. Stir in flour mixture. Cool for a few minutes (if batter is warm, chocolate chips will melt). Stir in chocolate chips and pecan pieces. Chill for 15-20 minutes. Preheat oven to 350 degrees. Scoop rounded tablespoons of batter and place on baking tray. Top each cookie lightly with a pinch of sea salt. Bake at 350 degrees for approximately 7-8 minutes until the outside looks slightly cracked. Do not over bake cookies as they will continue to cook once removed from the oven. Cookies should be soft and gooey in the center. Equality Florida has set up a GoFundMe page taking donations to help the Pulse shooting victims. In addition, I ask for you to please stand with the LGBTQ community and not against us. We are not the demons the religious extremists have tried to make us out to be. We are your brothers and your sisters and we, too, want to live our lives without fear. Pineapples were on sale, so we picked up a couple. The first recipe is for a light, tart and refreshing sorbet. The second is a bit sweeter but just as refreshing. Both make perfect summertime treats. Place in a blender the pineapple, lime zest and juice and water. Blend together and then add in sugar as necessary. You will need to add some sugar, as the sorbet won’t set properly without it. Aim for something a little sweeter than how you want the final product to be, as it loses some sweetness during freezing. Put mixture in your ice cream maker until it comes together. Place in the freezer to finish setting up. To make mint simple syrup: Bring to a boil 1 cup of water with 1 cup of sugar. Stir well to dissolve all the sugar. Pour over a handful of mint leaves and let steep on the counter for 30 minutes. Strain out the leaves and store the mint simple syrup in the refrigerator. Use in cocktails and sorbets. Blend together the pineapple, mint simple syrup and mint leaves. 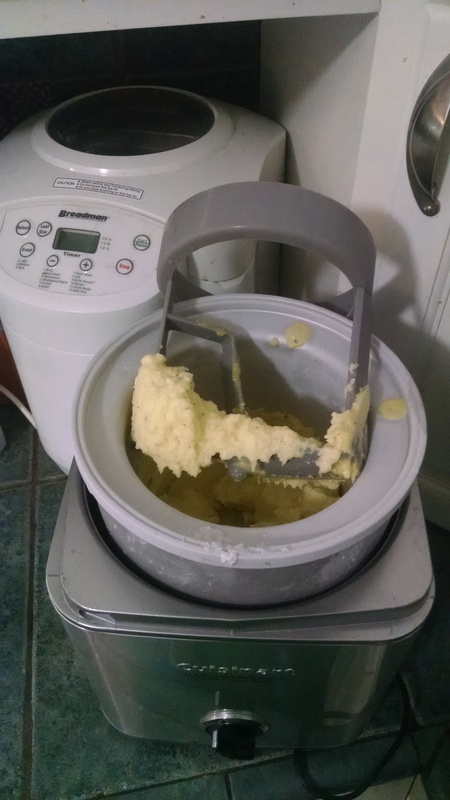 Put in your ice cream maker until it comes together. Freeze for a couple of hours before enjoying. For the birthday girl, I did a riff off a Martha Stewart recipe, using bittersweet chocolate and pecans in my recipe instead. I also had no heavy cream, so I made do with milk and melted butter (1/2 cup milk, 4 tablespoons butter, 4 ounces chocolate equals the ganache recipe below). The end result is a decadently rich, fudgy cake. Preheat oven to 350 degrees F. Butter an 8 inch round cake pan. Sprinkle in good quality cocoa to flour the pan. In a double boiler, melt butter and chocolate over simmering water. Remove from heat and mix in sugar and vanilla. Add in eggs and buttermilk. Stir in pecans and then mix in flour mixture until just combined. Pour batter into prepared pan. Bake until toothpick inserted in the center comes out clean, about 60-70 minutes. Let cool in pan for 5 minutes before removing to a wire rack. Let cool completely (about 3 hours) before frosting. To make the ganache, bring cream to a simmer in a small saucepan. Pour over chocolate and let sit for 3 minutes. Whisk until smooth. Pour ganache in center of the cake, spread evenly over the top and down the sides. Let set, about 30 minutes. Sprinkle the top with toasted pecans. It is Michelle’s birthday and I’m happy for an excuse to do some grilling. There is a sort of chocolate theme to the day, so the rub I’m using has unsweetened cocoa powder in it. Combine sugar and salt in a medium saucepan and stir. Add bay leaves, peppercorns and rosemary leaves. Bring to a boil, stirrimg to dissolve the sugar and salt. Boil for 5 minutes and then remove from the heat. Let the brine sit on the stove until it cools to room temperature. Add the pork loin roast to a zip top bag and pour over the brine. Squeeze out all the air and then seal the bag. Set in refrigerature for 12 to 24 hours. Make the rub by combining all 5 ingredients in a bowl and mix with your fingers to remove any lumps of brown sugar. Set aside until ready to use. Store any extra in an airtight container. 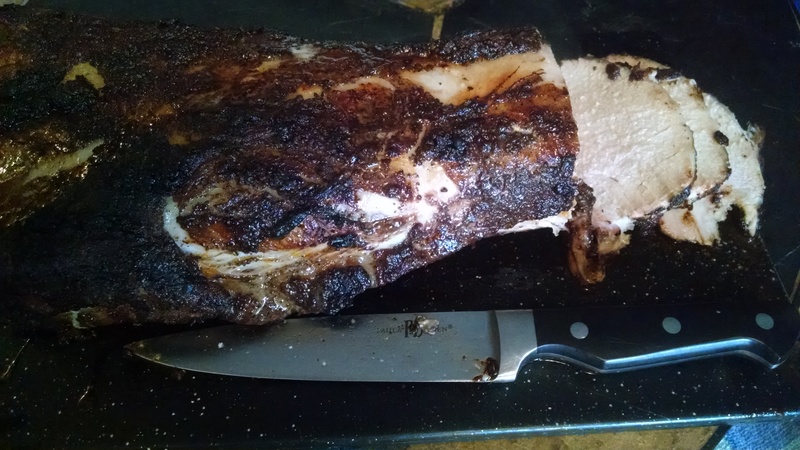 Remove pork loin from the refrigerator about an hour before you want to grill. Pull from brine and rinse off. About 30 minutes before grilling, generously coat the meat with dry rub. 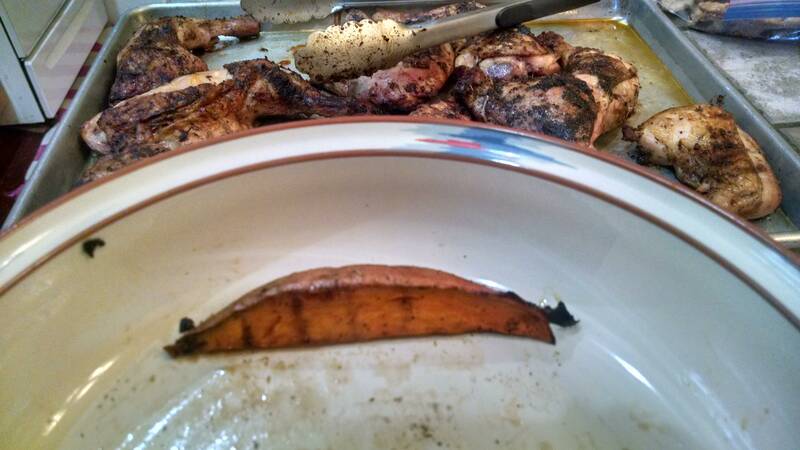 Set up your grill for indirect cooking with coals on either side and a channel down the middle. Drop in a couple of wood chips for smoke. Set an aluminum drip pan down the center. Start by searing the meat over the coals for about 2 minutes per side. After about 10 minutes and after plenty of grill marks, place the pork loin roast in the center of the grill, fat side up, and close the grill. Roast for 60 to 90 minutes, until the temperature of the center of the meat reaches 145 degrees F. Remove from the grill and lest rest 5 to 10 minutes. And, because Michelle likes veggies, I grilled some zucchini from her brother’s garden. I used this recipe from Ree Drummond, The Pioneer Woman. As someone who isnt a fan of zucchini, the marinade is good but finishing them with lemon salt makes them actually taste pretty darn good.